Despite some of the worst weather on record, there have been some fantastic achievements, including a new speed record set by John Williams and Andy Bardgett leading the race for the best UK height gain in 2012. Read about these flights and discover ways you can continue to develop your skills over the winter in the December-January issue of S&G, where you will also find the annual round-up of results and ratings. In what has been a lean year for wave, John Williams wasted no time when wave was forecast on 29 September, flying his Antares 20E from Portmoak and setting a new 300km out-and-return speed record at 166.88km/h. John suggests it can still be done faster and recommends a trip to Portmoak to give it a go yourself. “Even on a short winter day will do,” he says. A month earlier, Andy Bardgett contacted wave and climbed to 24,000ft above Wooler in his LS4b, giving him a total height gain of over 22,300ft. At the time of writing, this was the greatest height gain on the National Ladder and Andy is hoping it will stay that way. While those at wave sites have a potentially busier soaring year, for many of us there is a winter period when soaring options are in short supply. However, the winter months can present some great opportunities to develop skills and knowledge, particularly for those relatively new to the sport and those who like to be prepared. Pete Stratten’s article may also remind more experienced pilots of the fun there is to be had. 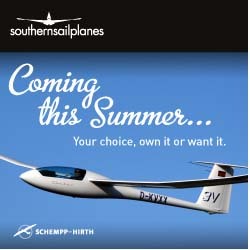 When the weather is really bad, how about competing around the world, or experiencing the glider you have always wanted to fly, from the comfort of your own armchair? Tony Lintott shares his experience of hosting a Monday night internet competition at Hus Bos last winter, with advice on how to host your own online Condor competitions. Also in this issue: Pete Stratten explains the importance of everyone understanding the issues before making a transition to EASA pilot licensing. Mike Gatfield reports from the Junior Nationals, described as one of the most fun comps in years. Bernard Eckey offers more soaring tips, explaining how our mood can affect our performance during a flight. Justin Wills reflects on a five-hour flight in the Rhonbussard that was the pride and joy of his brother, the late Chris Wills. 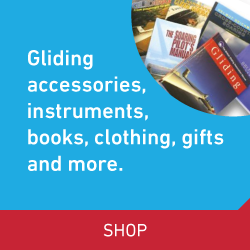 Mike Bird looks back to gliding 50 years ago. Charlie Jessop reflects on his first Competition Enterprise. David Weekes reports from the 40th VGC International Rally. John Clegg reviews the second edition of Steven Longland’s book Gliding: From passenger to pilot. BGA Development Officer Alison Randle looks at how clubs can make the most of winter months and reports from the 2012 Club Management Conference. 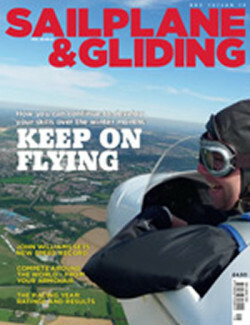 Vintage gliding news includes a report on the Slingsby Rally and a look ahead to the 2013 Wenlock Olympian Games. And there are more of your stunning images in the Gallery pages.